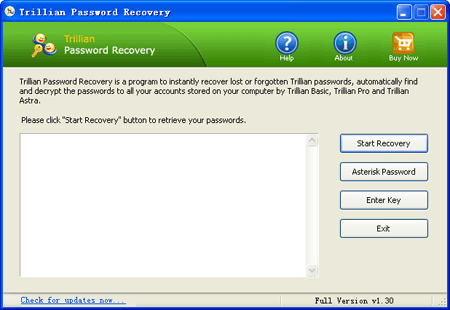 Trillian Password Recovery is a program to recover lost or forgotten Trillian passwords. It works with all versions of Trillian instant messenger: Trillian Basic, Trillian Pro and Trillian Astra. If there is more than one account in Trillian, Trillian Password Recovery recovers all passwords. One click and get your lost password instantly. Instantly recover all types of passwords saved in Trillian. Trillian Password Recovery additionally includes an universal password recovery tool: Asterisk Password. It enables you to view passwords hidden behind the asterisk characters in password fields of many instant messengers, not only for Trillian. Trillian Password Recovery helps you to find, decrypt and recover Trillian passwords stored on your local computer, decode all Trillian accounts passwords with just one click. You forgot your Trillian password and need it to install your contacts on a new laptop. You forgot your Yahoo! password but the password is automatically saved in Trillian which you use every day. You need to uncover the password stored behind asterisks so that you can access Yahoo! Mail. You've had your AIM account for going on several years and you realized the other day that you have forgotten your password. You can still log in via Trillian as it must store the password somehow. Now you need to get your password from Trillian. "Thank you for your assistance. This is a most useful piece of software. I have got my lost aim password back." "Just keep up the good work. I have passed on your website to many friends and recommended them to buy your products." Learn How can you recover Trillian passwords easily with Trillian Password Recovery program.